Indonesia has declared a state of emergency after a large oil spill ignited and killed at least four people in the port city of Balikpapan off the island of Borneo over the weekend. Fishermen told the Australian Broadcasting Corporation the spill has killed at least one protected dugong and the contamination could destroy their livelihoods. "It's a fire hazard and the smell is still there," local fisherman Maspele told the publication Monday. The city has distributed masks to protect residents, the Jakarta Post reported. "I may be exaggerating [with regard to smokers], but the bay is now like a gas station," Balikpapan secretary Sayid MN Fadli said at City Hall on Monday. Balikpapan, which has a population of 700,000 people, is a major mining and energy hub and home of state-owned energy company Pertamina. 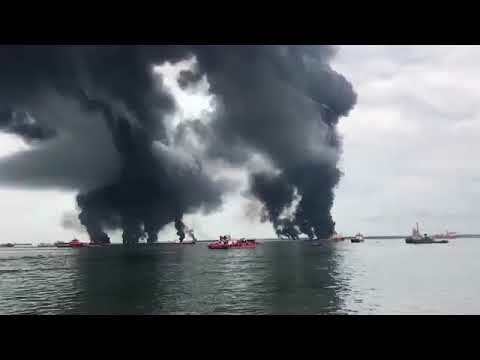 Pertamina said the disaster has nothing to do with its nearby refinery or undersea pipelines that run across the bay, the Australian Broadcasting Corporation reported. The firm's tests on oil samples found marine fuel oil used for ships, not crude oil, it said. Police are investigating the source of the spill and are questioning the crew of a bulk coal carrier operated by Chinese nationals and have taken samples from the ship, the MV Ever Judger. "We're questioning some witnesses including the boat crew of MV Ever Judger, also the local residents, workers from Pertamina—and we're waiting for all the results," Inspector General Widyanto said.